This article proposes two kinds of magnetic rotary actuators applicable to a next-generation capsule endoscope that can conduct a small intestinal biopsy. One actuator is for an anchoring mechanism that can stop the capsule in a specific place against the peristaltic movement of the small intestine, and press a biopsy instrument on a lesion. The other actuator is for a biopsy mechanism that can project a circular blade while rotating, and obtain a tissue sample. Both actuators have the same basic structure, which is composed of a bolt with a permanent magnet and a nut, and can be driven by a rotating magnetic field. Because they are arranged orthogonally to each other in the capsule, they can be individually operated by the corresponding rotating magnetic field. Given the results of an operational test similar to an actual environment in a porcine small intestine, these actuators could successfully perform the desired operation. T. Matsui, S. Murata, and T. Honda, “Fabrication of Magnetically Driven Biopsy Mechanism Applicable to Capsule-Type Medical Device,” J. Robot. Mechatron., Vol.30, No.2, pp. 292-299, 2018. G. Iddan, G. Meron, A. Glukhovsky, and P. Swain, “Wireless capsule endoscopy,” Nature, Vol.405, p. 417, 2000. J. F. Rey, H. Ogata, N. Hosoe, K. Ohtsuka, N. Ogata, K. Ikeda, H. Aihara, I. Pangtay, T. Hibi, S. E. Kudo, and H. Tajiri, “Blinded nonrandomized comparative study of gastric examination with a magnetically guided capsule endoscope and standard videoendoscope,” Gastrointest. Endosc., Vol.75, pp. 373-381, 2012. R. Eliakim, Z. Fireman, I. M. Gralnek, K. Yassin, M. Waterman, Y. Kopelman, J. Lachter, B. Koslowsky, and S. N. Adler, “Evaluation of the PillCam Colon capsule in the detection of colonic pathology: results of the first multicenter, prospective, comparative study,” Endoscopy, Vol.38, pp. 963-970, 2006. I. Fernandez-Urien, C. Carretero, R. Armendariz, and M. Muñoz-Navas, “Esophageal capsule endoscopy,” World J. Gastroenterol., Vol.14, pp. 5254-5260, 2008. M. Yamashita and T. Honda, “Fabrication of magnetic microactuators for cytology brush built into capsule endoscope,” Electron. Commun. Jpn., Vol.98, pp. 27-34, 2015. K. Hajima, M. Yamashita, and T. Honda, “Performance evaluation of magnetically driven cytology brush applicable to capsule endoscopy,” Int. J. Appl. Electromagn. Mech., Vol.50, pp. 167-176, 2016. 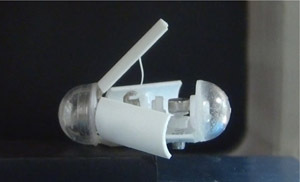 K. Kong, A. Yim, S. Choi, and D. Jeon, “A robotic biopsy device for capsule endoscopy,” J. Med. Devices, Vol.6, 031004, 2012. M. Simi, G. Gerboni, and A. Menciassi, “Magnetic torsion spring mechanism for a wireless biopsy capsule,” J. Med. Devices, Vol.7, 041009, 2013. K. Choi, S. M. Jeon, J. K. Nam, and G. H. Jang, “A magnetic minirobot with anchoring and drilling ability in tubular environments actuated by external magnetic fields,” J. Appl. Phys., Vol.117, 17A730, 2015. E. Braunwald, A. S. Fauci, D. L. Kasper, S. L. Hauser, D. L. Longo, and J. L. Jameson, “Harrison’s Principles of Internal Medicine,” 15th Edition, McGraw-Hill, p. 1703, 2001. R. N. Miftahof, “The wave phenomena in smooth muscle syncytia,” In Silico Biol., Vol.5, pp. 479-498, 2005.